Promoting Equity, Empathy, and Engagement in the World Language Classroom with Simple Tasks! 1. 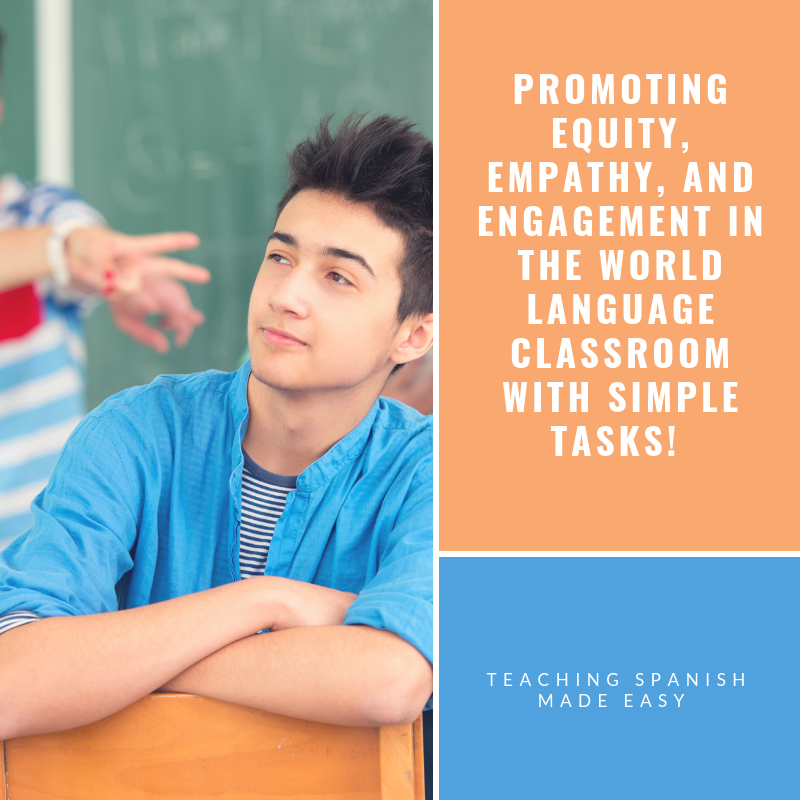 These activities foster community in the world language classroom. 2. They promote equity in the classroom, which in turn creates a thriving community where taking risks, are the norm, and not the exception. 3. 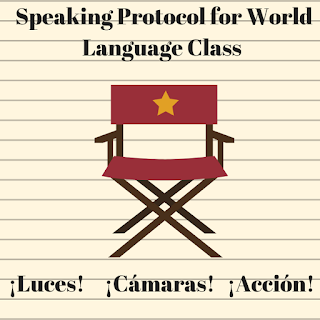 They hit all the communicative modes: Interpersonal Speaking, Interpretive Reading, Presentational Speaking, Interpretive Listening, and Presentational Writing. 4. They connect to students' passions in life. 5. They present useful structures that students will recycle throughout the year! One week prior to the beginning of classes, our school, like most other educational institutions, had a full week of Professional Development. This year was a bit different. Our PPLC had worked diligently throughout the summer months piecing together a dynamic learning schedule that would make us reflect on our practices, challenge inequitable positions, and recommit to our students' success. The topic was "Equity." 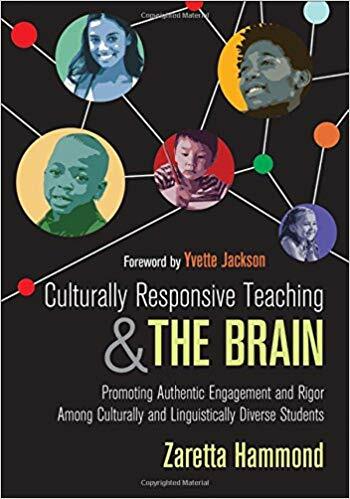 I thought I knew what equity was and that I was an "equitable" teacher, but I discovered more about myself, my colleagues, and the nature of learning and brain. In this post, I'd like to share on how this teacher-led PD changed my perspective on the topic and has been slowing reshaping my instructional practices. 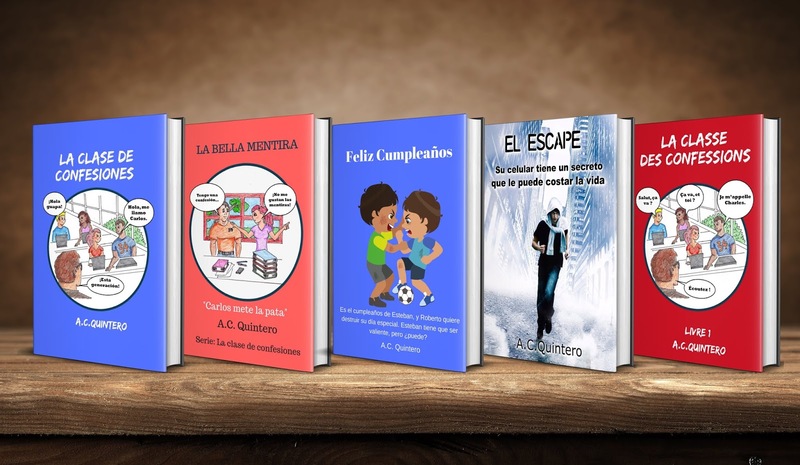 I will provide several ideas, examples, and downloadable activities that YOU CAN USE IN YOUR CLASSROOM AS WELL! 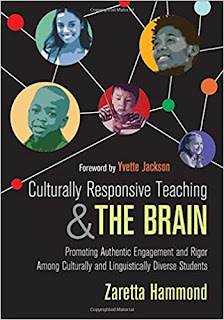 The aforementioned PD was largely based on Zarreta Hammond's book: Culturally Responsive Teaching and the Brain. Slowing down and taking the temperature of the class, on the surface, does not seem like a practice to promote equity. It appears to be more of a personal realization of the teacher switching up her instructional approach. However, after a week on equitable practices in the classroom, the practice of slowing down has enabled me to better "understand where students are in the lesson." If I better understand where students are on the learning continuum, the better able I am at adjusting the lesson to accommodate them; and that is an equitable practice. This was best illustrated during the first activity of our unit on Identity. 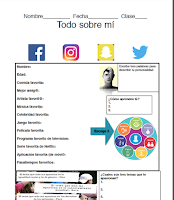 I do this unit every year, and prior to getting into the nuts and bolts of the unit, we engage in a "Todo sobre mí" activity, which is a free activity on Teacherspayteachers.com. 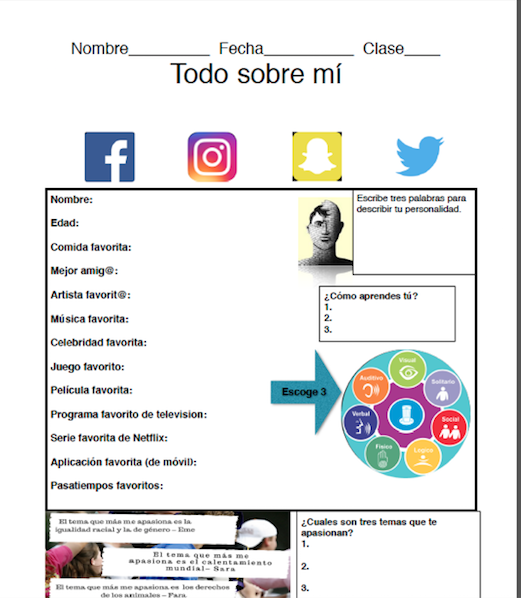 This activity includes some basic to thought-provoking questions about students' interests, personality, and learning styles. Every year, I'd start by distributing the activity, and giving students 10-15 minutes to finish. They'd share with other students and then we'd move on. However, this year, after our PD, I decided to slow things down a bit, and I am glad I did. This 15-minute activity morphed into a dynamic community-building, communicatively rich three- day task, where equity was the centerpiece. Here is how I tweaked the lesson in order to cultivate students' voice and to build community (my previous goals were completing, sharing and getting into the main course of the unit). 1. I made time to listen and "hear" students; I also made sure that other students "heard" each other. I had them sit down, look each other in the eye, listen, and ask good follow up questions. Each student had the same amount of speaking time. 2. I gave them tools (structures) for sharing about themselves, to their classmates in a meaningful way. In asking students to share, I simply wrote phrases on the board that they could use. 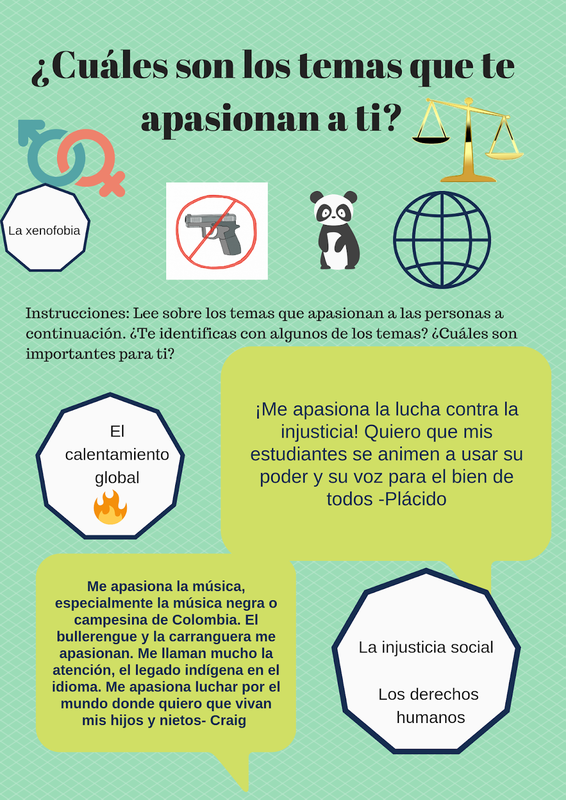 For the "Lo que me apasiona" activity, I curated some phrases and gave them a guide sheet. This helped students who might have experienced some attrition over the summer with those phrases. I wanted everyone to feel and be successful. This leveled the "language field." Throughout the lesson, I felt myself adjusting to their needs, and not the other way around. 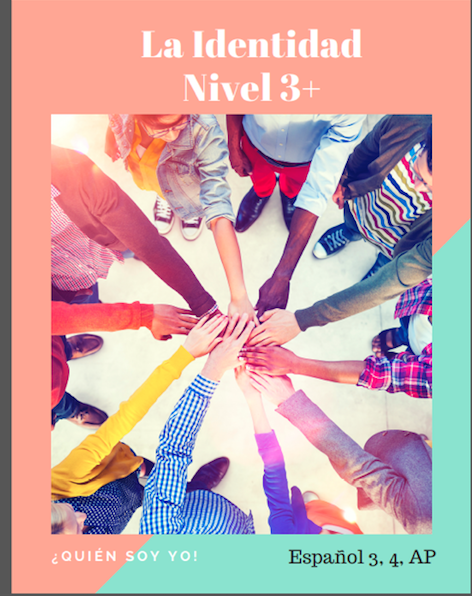 Since I had primarily made this activity about community, the goal was communication and building relationships, with is my equity goal for the first quarter. 2. 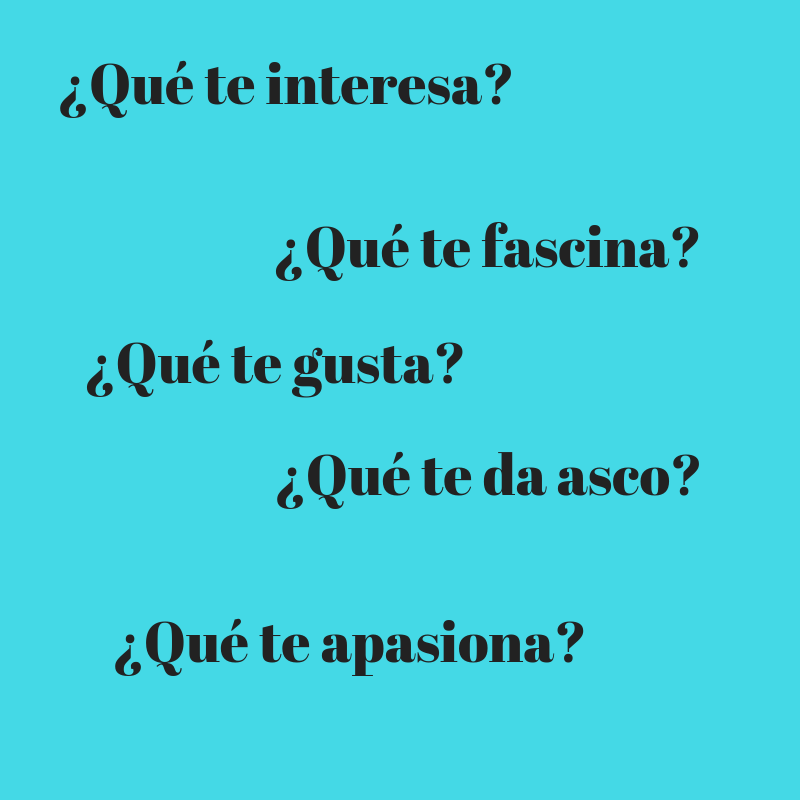 Todo Sobre Mí: No, let's really get to know each other! Since my Spanish IV students knew how to respond the first few cognate-rich questions of this activity "Todo sobre mí" , I centered upon the meatier questions such as "¿Cual es un tema que te apasiona?" I knew that this would have been really important for them, even more so than the superficial information solicited in the queries leading up this "essential question." Don't get me wrong, in no way I am not saying that those superficial questions were not relevant, but the notion of sharing about what drives you, and what you're passionate about, centers on at what you care about as a person; and that's a game-changer. We chewed on this question for two days (tons of confidence- building, reading and language exercises in between), and it was amazing. Check out the flow below! Students had an opportunity to interact with the language and structures "Me apasiona"
Students had an opportunity to read and discuss the passions of others before crafting their own (cognitive priming/ building interest). Initially, we were talking about our passions, but seeing the teachable moment, I also wanted students to incorporate similar structures and thus add more vocabulary to their toolbox. 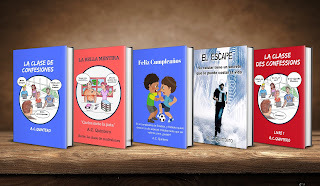 I simply added structures that were similar to "me apasiona." After modeling, and giving examples, they seamlessly incorporated these structures into the conversation. I had them also discuss the questions below. We even threw in a "Persona Especial"(see section below) interview with a few of the students. They got to sit on the class throne and share about their gustos and disgustos. 4. Incorporating "La persona especial"
This was a very natural segue. 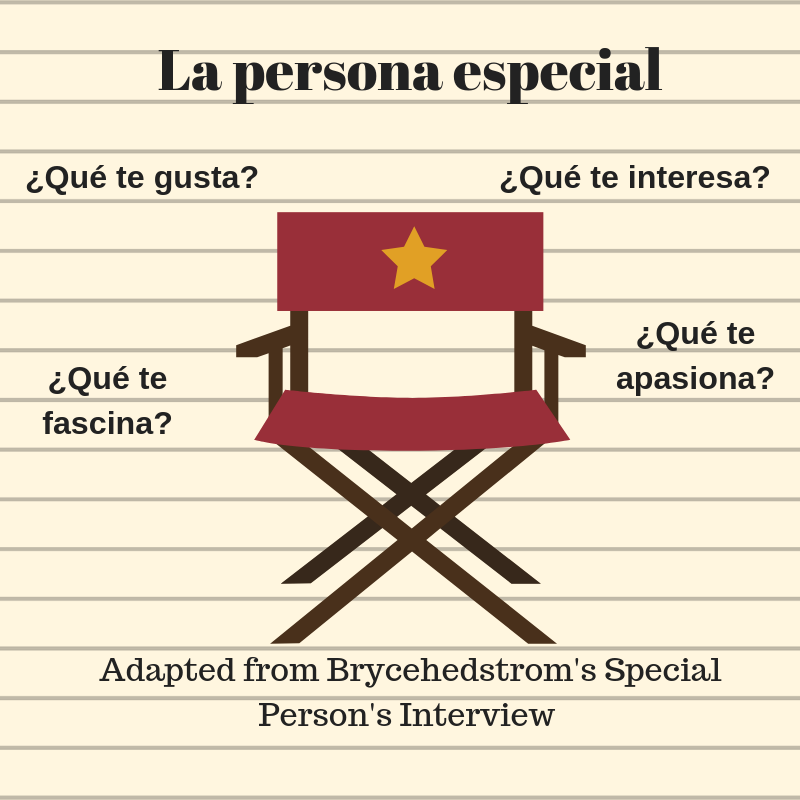 I had not planned on doing Bryce's "Persona Especial" but it fit naturally with what we were doing. An important tenet of equity is dismantling "hegemony", which in my case is "teacher-led and controlled class". Instead of me asking the questions, I empowered my students to ask questions, and it was electric. A few students who had been quiet before were stealing the show! They asked so many questions, that we had to extend the activity. 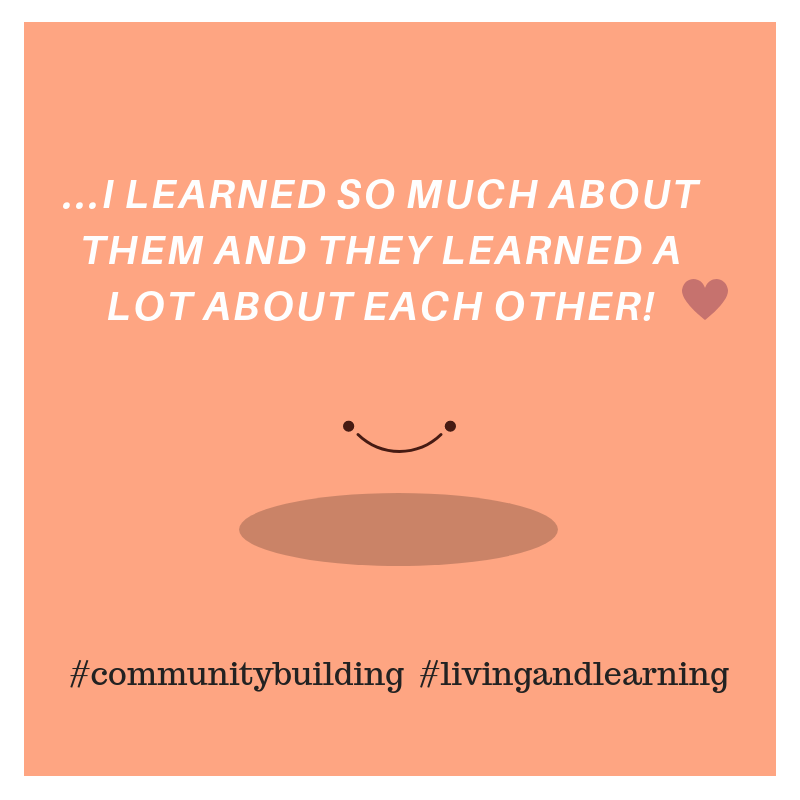 But most importantly, I learned so much about them, and they learned a lot about each other! After "think-tank time", students had a chance to talk it out with a friend. Yes, I did this protocol before, but my intentions were different. In the past, I had students talk it over with a friend in class, not to solidify their ideas and become more confident speakers, but to just "talk it out." 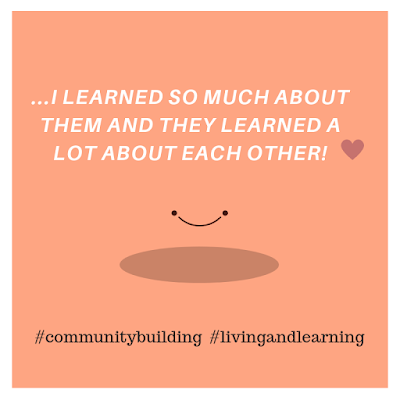 I learned in our PD that talking it over with a friend first, before sharing with the class (which I would normally do), builds students' confidence. I added one more thing to the mix. In sharing, I ASKED STUDENT TO TAKE NOTE OF WHAT THEY DID NOT KNOW HOW TO SAY. This simple gesture communicated to them that I DON'T EXPECT THEM TO KNOW EVERYTHING, and it is okay not to know. Of course, our next step was to circumlocute with a partner. I saw sparks! 2. Make a short list of words that they'll need for discussing their topic. 3. Think deeply about WHY they are passionate about the topic. Then, we did a speaking protocol(I modified it slightly) that I learned from our Equity training. 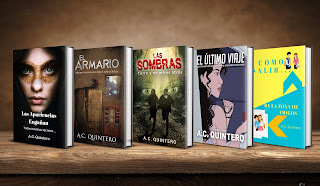 I call it: Luces, Camaras, Acción. 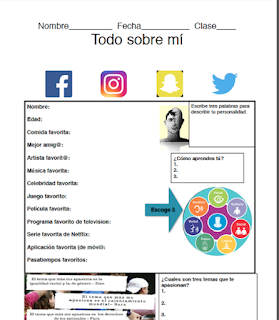 Luces: Students may use the planning template to discuss their topic. I emphasize "glancing" at the template and looking at listener while they talk. They have to share and then listen to the other student. Teachers may have other students ask clarifying questions about vocabulary and also why the speaker thinks it is a worthwhile topic. 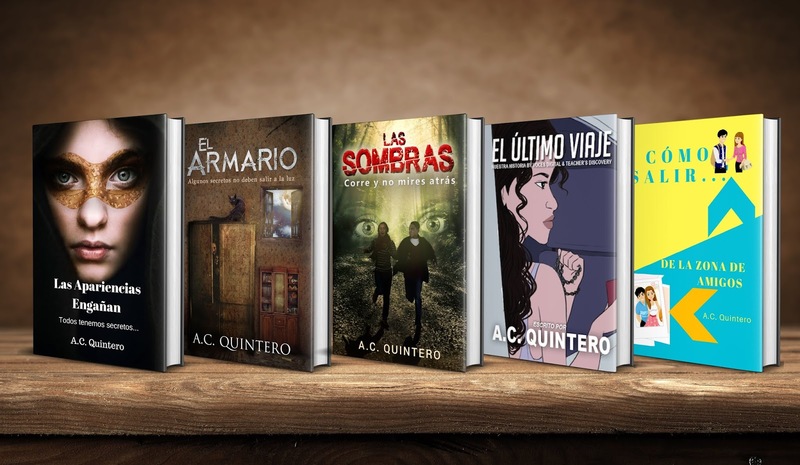 Cámaras: Students now speak to a different student. This time, they try to depend less on their graphic organizer. Acción: This step consists of students speaking to other students without the graphic organizer. For the last activity, I gave students 45 seconds to share. They ended up sharing for 2 minutes! Speaking to other students beforehand, really made the difference! In the end, this activity was really fun! After a few days, I created a short assessment. 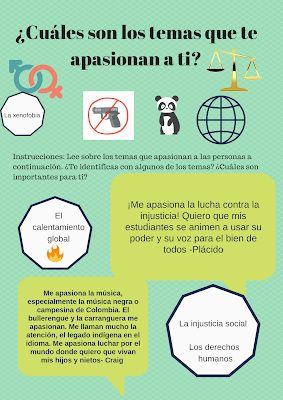 Students got into pairs and I interviewed them on the topics about which they were passionate. Most of the students spoke eloquently about the "medio ambiente". I was sooo impressed. The level 3 teacher told me that that was their last unit of the year! ¡Con razón hablaban con tanta fluidez! You can download the activity below. Please enjoy! Stay tuned as my next blog post for levels 3/4 will center on a poem (La mujer del otro lado) we read in class and the Identity Movie Talk (free on TPT). This poem is so amazing, as it is the perfect poem with which to discuss the theme of identity. I have a few activities and assessments we embarked on, so stay tuned!!!! 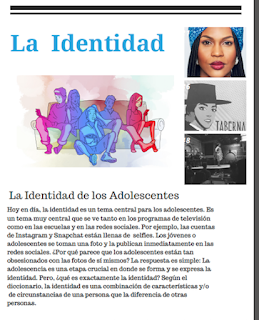 All the activities that will be shared over the next two posts will eventually lead up to our Identity unit! Articles include a variety of engagement activities including reading comprehension questions, writing prompts, and debate activities!